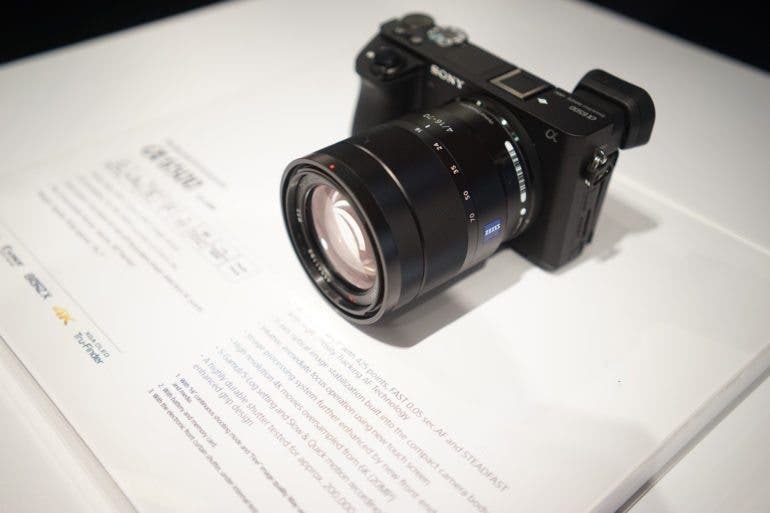 Sony has been busy with the recent announcement of the a99 II. Hot on it’s heels Sony announced today the upcoming release of the all-new Sony a6500, the flagship of the a6000 lineup. We got a chance to play with the camera for a bit a lt their event to test out the new features such as improved autofocus and touch screen ability. Although we weren’t allowed to take home sample images, we’re quite impressed with what we’ve seen so far. Fans of Sony’s a6000 series will feel right at home with the a6500. The small, sleek design is largely unchanged when compared to other models in the lineup. Where it differs is that it’s borrowed a few features from the a7II series of full-frame cameras, and now includes a more robust lens mount, a recessed grip for better handling, larger release button, and up to 10 customizable buttons. The new magnesium alloy body feels rock solid. It even gives the camera somewhat of a premium feel especially when compared to previous cameras in the lineup. This is meant to be a serious camera even pros will be proud to use on a daily basis. Lastly, the buttons/dials are all logically placed and a great size for those with larger hands. Going back to the magnesium alloy body, the a6500 feels solid, but not overly rugged. Sony made no mention of weather sealing so I wouldn’t suggest using it in the most extreme climate conditions. For those who need a camera for the long haul and tend to shoot frequently, you’ll appreciate the new high-durability shutter which has a tested life span of 200,000 release cycles. On the autofocus front, the a6500 gets Sony’s 4D Focus with 425 Phase-Detect Points. Rated the fastest in its class, I can see why when I took some shots with it at the event. Focus was quick and locked on from subject to subject as I focused on numerous people in the crowded event room. This will be perfect for event photographers who need to quickly capture a subject, say a bride, in a crowded setting. While I rated focusing fast overall, when I initially used the camera I wasn’t so sure as the unit I had had the Sony 85mm 1.4GM attached. The lens would hunt for a bit before acquiring focus in the dimly lit room. In brighter areas it was more reliable. I swapped that lens for the 24-70 2.8GM and the focus capability exceeded my expectations. It was very, very snappy and I couldn’t miss a shot. It tracked wonderfully. I would be more than comfortable shooting fast moving objects in all settings with it, so sports photographers may want to take note! But keep in mind your lens choice and shooting environment will be factors in getting the most out of the focus system. A new feature unique to the a6500 is it’s new Touch Screen Focusing ability. Users can lock focus on a subject simply by touching it on the screen. I played around with the feature, and in landscape orientation it’s actually quite useful. I found it a bit awkward in portrait orientation, but that may be something that you become more accustomed to with time. However, I see it being an invaluable feature for video users. At one time Sony’s menu system was one of the least liked, but Sony has done a better job in recent years of improving this minor annoyance. The new menu system is easy to follow, but also packed with customization options. These are pretty deep menus mainly due to many of the new functions with the camera. When I picked up the unit to test out, I was able to set the camera to my liking in about 2 minutes. I usually turn some of the features off like “Face Detection” so I can use the camera how I would in a professional setting. Overall, it’s super simple to use with more than enough complexity for those who like to really tinker with their cameras. Unfortunately, we were shooting on Sony’s demo units and were unable to bring back sample images. Overall, the Sony a6500 looks to be a very solid product. 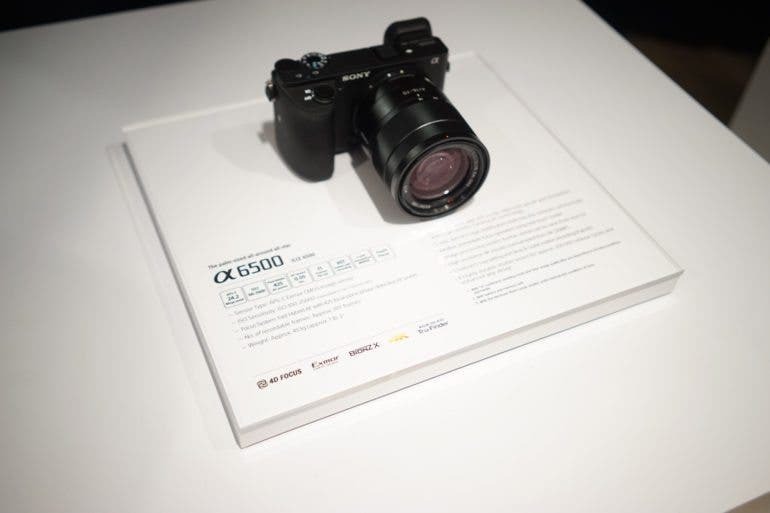 I’ve enjoyed the a6000 lineup in the past and this one is a big improvement in the right direction. It’s loaded with features and from what I’ve experienced thus far, delivers in spades. I wish I would have gotten to take the video capabilities through its paces, but as a stills cameras it is going to be one of the better options for hobbyists and pros alike. I’d say the other cameras in the same price-range have been put on notice.